Traveling overseas is always an adventure. But the fun side of that adventure can turn to pain if you aren’t prepared. Making sure the devices we rely on to keep us connected is one of the top challenges. Before a recent trip to Italy, one of my big questions was how I would keep my devices charged. Different countries use different outlets and voltages, many of which aren’t compatible with the chargers we have in the U.S..
We relied on our ability to purchase an adapter once we got there which proved more challenging than expected. When we asked, some said we just needed an adapter, others said we would need a converter. Others said it depended on what we were plugging in and where. We opted for a $20 universal adapter. It was the only thing we could find while stumbling around Venice trying to find anyone that had anything that could help. It turned out the adapter was the same make we would find throughout Italy. It is a cheap, mass-produced, made for a tourist universal adapter. The good news is it worked! The bad news is it only worked once. We bought more than one and none lasted. It felt like a racket, but it was just a poorly made product. Even when it did work, it only allowed us to charge one device at a time. For two people traveling with iPhones, apple watches, laptops, and a camera, it only went a small way toward solving the problem. After returning to the U.S. I set out to find something that would be more suitable for our future travels. Then, OneAdaptr reached out asking if I would like to review their new universal charging station. Given my recent experience, seemed like a pretty good idea! Gone are the days of needing multiple, changeable adapters with several parts. The Twist Plus is a compact single unit, and designed to stay firm in when plugged in. Even when plugged into older outlets that are a little loose, the Twist stayed secure. In every case we tried the charging station, it left enough room next to it not to obscure the adjacent outlet. The added weight of the MacBook power brick doesn’t leave the Twist Plus feeling any less sturdy in the wall. One of my favorite decisions of the OneAdaptr team is the use of a rotating dial to flip through the different plug options. Just push a button and turn. When the one you want pops all the way out, just let off the button and it’s locked in place. The twisting motion isn’t quite as smooth on my demo unit as I would prefer but that is a small gripe and doesn’t detract from how well this product solves the charging dilemma. The barrel shaped design is also far more attractive than other chargers we’ve seen. The built in adapters will cover you in over 150 countries so the moniker “universal” is more than fair. One of the keys to a universal charging station is showing only the plug you need for the given location while hiding the rest. The Twist accomplishes this using a rotating dial that cycles through the various plugs when you turn it, exposing one and retracting the others. We always travel with several devices so the 4 USB ports are a huge benefit. The USB ports run up to 4.0Amp while charging multiple devices at once. The also Twist has built in 3A fuse protection in case of a surge and can handle outlets from 110 – 240Vac. The addition of the MackBook adapter is a must-have if you are a Mac user. 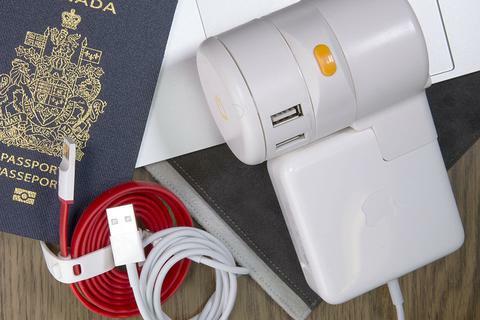 It will keep your workspace tidy while freeing up plugs for other travelers or devices which may need them. If first impressions matter, they had me at hello. After traveling the US with it, I’m still a fan. I’m not traveling outside the U.S. for a while so I won’t get to test it overseas until then but I’ll be sure to report back when I do. But based on our experience so far, the Twist Plus is a bargain. If you’re searching for a well built universal charging station that will help you keep several devices charged on your trip take a look at the Twist Plus. If you’re not a MacBook user, you they also have devices without the MacBook charging port. The device is $44.99 (USD) which I would consider a bargain. Remember we spent $20 each on devices while overseas that weren’t lasting more than one use. Not to mention the inconvenience of having to keep hunting them down. Not only will this device last, it will give you peace of mind knowing that you will be able to charge your devices in many locations. Buy the Twist Plus Universal adapter on Oneadaptr.com.